Watch NBA basketball in OKC, and provide an educational experience for students! 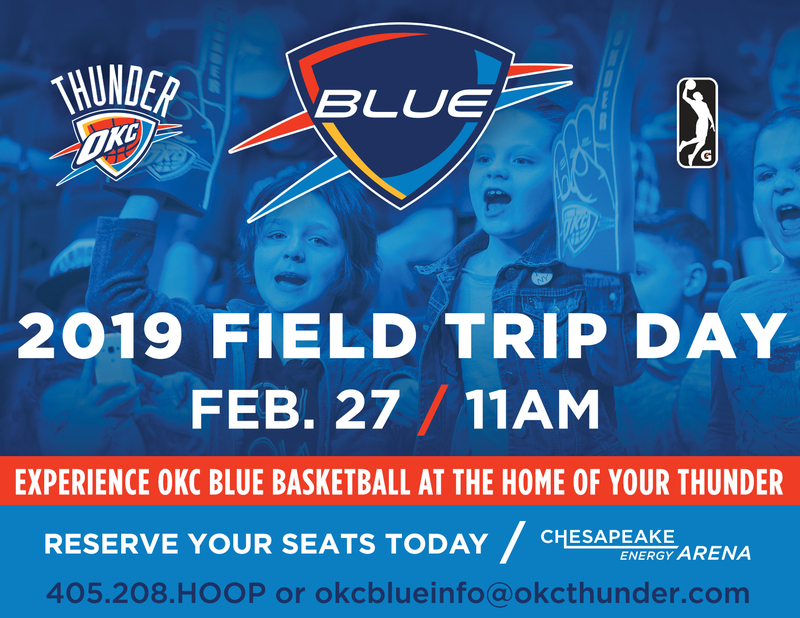 The Oklahoma City Blue, the NBA G League affiliate of the NBA’s Oklahoma City Thunder, will be playing a Field Trip Day game at Chesapeake Energy Arena on Wednesday, Feb. 27. This unique game experience pairs the excitement of NBA basketball with an educational focus on STEM curriculum. We’ll bring lots of entertainment to keep every fan engaged, including Thunder mascot Rumble the Bison, the Thunder Girls dance team, Thunder Drummers and our interactive squad, the Storm Chasers. WHAT IS THE OKLAHOMA CITY BLUE? The Oklahoma City Blue is the NBA G League affiliate of the Oklahoma City Thunder. The Blue plays 50 games every year in a league of 27 teams from the U.S. and Canada. Last year, the Blue finished the regular season with the No. 3 seed in the Western Conference and claimed the Midwest Division title. WHAT IS FIELD TRIP DAY? Now an annual tradition in OKC, Field Trip Day allows school groups, families and other fans an opportunity to experience the excitement of NBA basketball in an educational environment. Starting on the bus ride and continuing throughout the game, STEM facts, videos and activities are shared. During halftime, Thunder mascot Rumble the Bison joins in on a science-themed demonstration on the court. WHAT SHOULD WE EXPECT? The Oklahoma City Blue will tip off at 11 a.m.; games typically last 2 1/2 hours. In addition to the STEM-focused elements and, of course, the basketball game taking place on the court, Thunder entertainers will engage with fans to ensure everyone in attendance has a memorable experience.